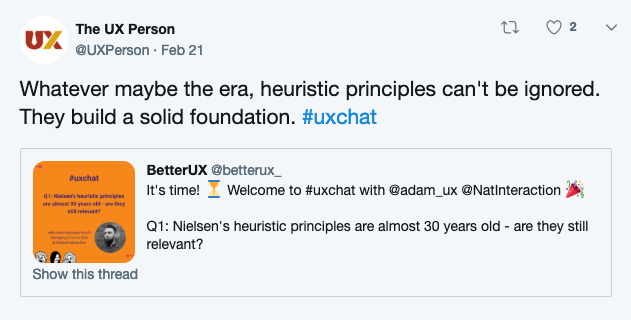 Usability heuristics were first created back in 1990 by the two godfathers of usability Jakob Nielsen and Rolf Molich. Nielsen then went on to develop them further, publishing the final 10 principles in his 1994 book ‘Usability Engineering’. This was the first time that these types of rules had been specifically created for user interface design. Since then, they’ve formed the very backbone of how modern user experience works. 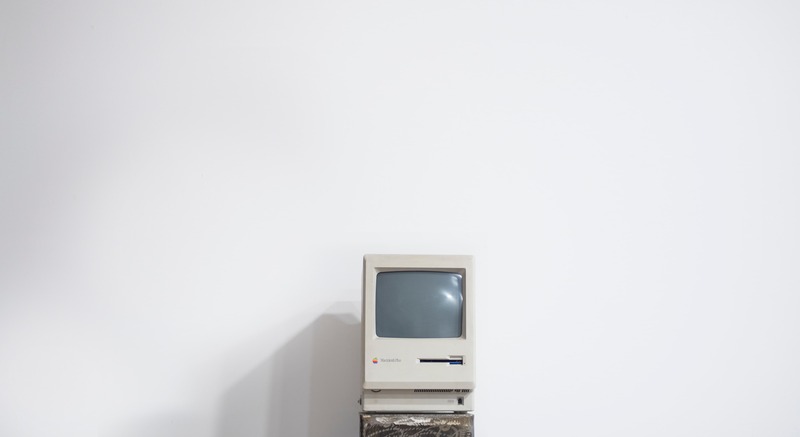 But, as they approach 30 years old and with huge technological, design and working style changes in that time we were interested to see what our peers thought about heuristics now, in 2019. We posed three questions to the group. Here are some of our favourite answers. If you want to see the whole conversation, head to twitter to see the full thread. 1) Nielsen’s heuristic principles are almost 30 years old – are they still relevant? The overarching answer was yes, although some people were keen to point out that the principles should be used more as a general rule of thumb than a firm guide. Some people felt even more strongly that heuristics are still as relevant as the day they were created. After all, they came out of a lot of testing and whilst the interfaces may have moved on, the principles remain broadly the same. 2) Is heuristic evaluation as worthwhile as usability testing? Which is better? This question was always going to split the group. 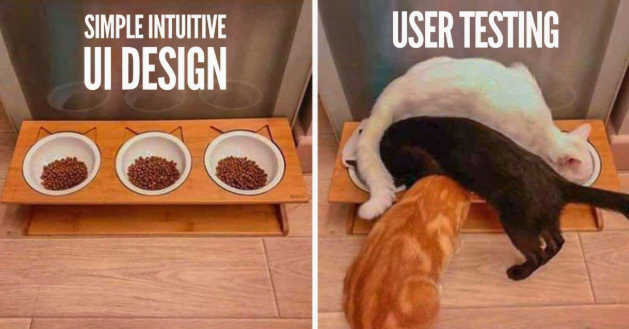 For us, UX without users (ie.testing) is not true UX and so, whilst heuristic evaluation is useful, we don’t see a time when it could replace testing with real users and that’s always our advice to clients. That said, some of our group referenced situations when testing might not be possible, for example when budget is very small. Heuristic evaluation is better than nothing at all. 3) Do you think that the 10 general principles for interaction design are still correct? Is there anything which needs adding or removing? Given that the general consensus from Q1 was that Neilsen’s heuristic principles are broadly still useful, it’s no surprise that people agreed that they are still correct, when taken as a guide not the rule. Most of the discussion took place around #10 - help and documentation. Since 1994, user interface design has changed a lot and in most cases, for example Alexa, google drive, iPhones, the on-boarding is so user friendly that a manual or reams of documentation are just not necessary. This doesn’t mean though, that ‘help and documentation’ should be removed from the list. There was also some talk about adding an #11 to cover responsive design, something which has developed since Neilsen wrote the original principles but again, using them as a guide means that they can be interpreted as needed. 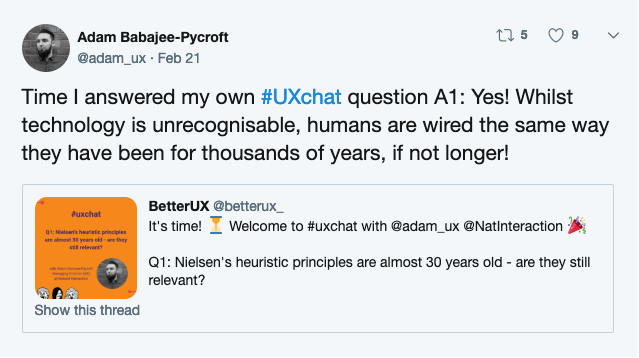 Would you like to take part in UX chat? This one-hour live twitter discussion (via the #uxchat Twitter hashtag) takes place every Thursday, 4pm GMT / 11am ET / 8am PT. To find out more and see this week’s topic, follow Better UX.